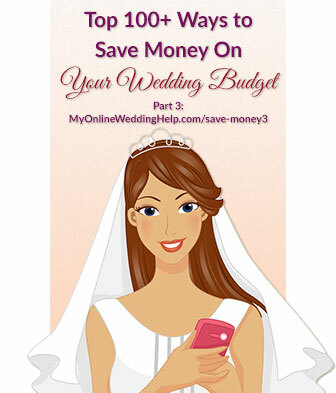 Here, in part three, are the final 37 tips to help you save money on wedding costs. You will find ideas for the rehearsal dinner, rings, skin care, dress and accessories, save the dates, jewelry, the reception, and gifts. Part one covered the money management as well as venue and planner, caterer, and toast. In part two, you can read tips for saving on drinks, cake and dessert, flowers, centerpieces, photo and video, beauty items, and live entertainment. 77. Harness both the power of the Internet and local discounts to keep costs down. 78. If you decide an upscale, formal rehearsal dinner is a must, keep it intimate with only the wedding party. You can also have a larger, informal get together to include out-of-town guests and close family. The cost of the two can be less than one fancy event for everyone. 79. Alternately, have one event and include only the core wedding group in the rehearsal dinner. 80. Pick up food for the rehearsal dinner at a warehouse club store. 81. Serve filling, yet inexpensive foods at the rehearsal dinner, such as pizza; hot dogs and hamburgers; Chinese food; barbeque; deli-type sandwiches; or lasagna, spaghetti, or other one-pot meal. 82. Have a light lunch or brunch instead of full-scale dinner as your rehearsal meal. 83. Find a free public or private setting for the rehearsal dinner. 84. Hold the rehearsal dinner at a buffet or other low-cost restaurant. 85. Set a wedding bands budget that is in line with what you can afford (in other words, ignore what some say you should do and buy only what you can instead). 86. When you are considering a ring with diamonds, first determine what minimum level of appearance and quality is acceptable to both of you, and compare the corresponding range of prices to your budget. Lower quality means a larger diamond. Higher quality means better appearance, but smaller size. 87. If you do decide to go with an investment-grade diamond, have it certified to avoid getting ripped off and as proof of quality to those who later inherit it. 88. For the ultimate budget-saver, buy cubic zirconia ring(s) to get the sparkly appearance without the cost. These wedding ring sets are all around $50 or less. Details of each are below, or go here for a bit larger selection. 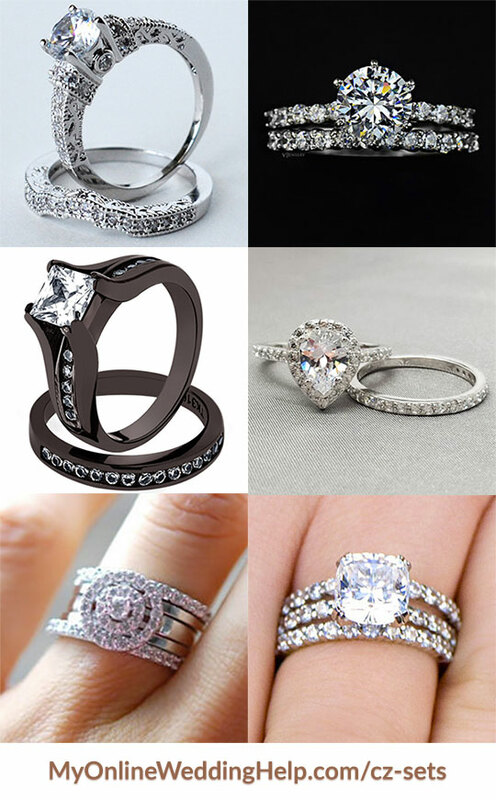 Top Left: Myra uses hand cut, polished cubic zirconia in this 4.9 CTW etched wedding ring set. She has several other equally unique ring designs. Top Right: Olga creates a tarnish resistant and long lasting mirror finish by plating this ring with high quality white gold rhodium. It is also free of lead, nickel, and cadmium. The center stone is 1.75 carats. Middle Left: Samantha makes this unique chocolate wedding band set with colorless D grade stones channel set in highly polished stainless steel for maximum flash. The main stone is princess cut 1.25 carat, with 2.10 CTW for the ring. Middle Right: Alida and Janice sell their own brand of jewelry and mark their sterling silver pieces, such as this 1.85 carat CTW pear shape engagement and wedding band set with “925 ALIDA”. They also use only the finest cubic zirconia, with color, clarity and excellent cut to match natural diamond standards. Bottom Left: Lola created this five-band wedding ring set to be worn together or separately. She’s included the main solitaire engagement ring, two matching wedding bands with pave stones, and another two plain wedding bands. Bottom Right: This ring is also one of Lola’s creations. The three ring wedding band set is 3 CTW and includes the engagement ring, an eternity band, and half-eternity band. It is made from rhodium plated sterling silver. 89. Choose affordable gemstones to convey additional symbolism through the rings. 90. Choose metals for the rings that are in line with your budget (silver, titanium, tungsten, and stainless steel tend to be the most economically-priced). 91. To afford a larger-looking ring, buy a design with a frame, halo, or cluster of small stones. 92. Look at individual engagement rings and wedding bands, as well as two- and three-ring sets, and compare costs. 93. Focus on symbolism instead of cost of the wedding bands. 94. Avoid financing the wedding rings. The interest can substantially add to the cost. 95. Buy inexpensive “placeholder” rings such as the sets featured above, and upgrade later when you can. 96. Shop from jewelers with lower overhead that pass along the savings to customers in the form of lower prices. 97. Try over-the-counter products and home remedies for problem skin before seeking help from a dermatologist. 98. Rely on customer reviews and comparison studies, not price, to choose skin-care items. 99. For a possible tax deduction, donate your wedding ensemble to a local charity that helps those who cannot afford a wedding. There are several organizations that specialize in finding wedding gown new homes. Check the wedding donations ideas pin board for some of them. 100. Shop wedding sample sales. 101. Check for sale and clearance sections on a shoe sellers’ websites. 103. Make your own belts or sashes. 104. Buy an inexpensive veil from a wholesale-priced merchant or on eBay. Find veils under $40 here (most are well under half that price). 105. Buy affordable tiaras online instead of at a pricey bridal-shop style. Most of these are just a few dollars. 106. Buy fashion jewelry instead of fine jewelry. Handcrafted jewelry is extremely popular and can be both attractive and inexpensive. These are all around $20 or less. Details about and links to those in the photos are below, or go here for these and other jewelry pieces under $20. Top Left: This silver and purple calla lily necklace could be a gift for the bridesmaids or for the moms. Virginie ships these with an organza gift bag. The chain come in 17″, 18″, or 19″. She says you can request a custom length at no added charge. Top Right: Christina makes this stainless steel name necklace with 316 marine grade stainless steel attached to a surgical grade steel chain. This means high quality metal for you at an affordable price. Choose 14″, 16″, 18″, or 20″ chain, or you can get the pendant only for $5 off the necklace price. Second Row Left: This Swarovski pearl necklace and earring set is an excellent value. Maria will make yours in white as shown or you can pick any of 37 different pearl colors and leave your choice in the notes. Second Row Right: The filigree detailing on Holly’s pearl and crystal drop earrings make them perfect for an elegant wedding. She uses 10MM Ultra Pearls, with a choice of 14 colors so you can match them to your wedding colors if you’d like. No worries if not everyone has pierced ears. You can get them as clip-ons as well. Third Row Left: Esther crafts these teardrop earrings from platinum plated cubic zirconia pendants. Buy just the earrings to stay within a $20 budget, or choose both earrings and necklace for a wedding set. The thank you card is optional, making these a budget-friendly idea for the bride’s jewelry as well. Third Row Right: This three-charm bridesmaid necklace is customizable for each recipient. Brandy stamps your choice of initial on the leaf. Plus you get any of 23 stone colors, so you can match wedding colors or each lady’s birthstone. The accompanying thank you card can be for a bridesmaid, maid of honor, or matron of honor. Bottom Left: Hina’s delicate personalized 18K gold plated bracelet is 2″ diameter, making it a perfect gift for a young flower girl. It comes with a gift box. Bottom Right: If you are looking for a gift for a girl who is a bit older, this bracelet is made from an (approximately) 7.5″ piece of stretch elastic. Kathleen makes it with your choice of purple or white glass pearls, rhinestone beads, and a heart shaped flower girl charm. The accompanying card can say “Thank you for being…” or “Will you be my flower girl.” Check it out here. 107. Choose inexpensive gemstone jewelry in your wedding colors for the bridesmaids. 108. Send save-the-dates to only your closest friends and family. 109. Send save-the-date postcards which not only cost less to buy but also require less postage. Find inexpensive styles here. 110. To save on stamps, hand-deliver save-the-date cards and invitations to local people. 111. Find a “pre-decorated” venue. 112. Choose inexpensive favors to give to guests. These favors are all $1 or less each. Top Left: These bridesmaid hangers look expensive but are ultra-cheap. I especially like these because you can get them in different woods and different color lettering. Tara recommends you choose lighter colored type for dark wood, and darker lettering on light wood. Top Right: Sandra’s custom message makeup bags are another popular bridesmaid’s gift. She allows any message, up to twelve words on three lines, and has many choices for lining color. This listing is for five gold bags, but look around her shop to find black or silver as well, plus different quantities. Second Row Left: This customized four charm MOG or MOB bracelet includes a variety of options: (1) The heart as shown (with “Mother of the Groom” or “Mother of the Bride” engraved), a rhinestone cross, or a rhinestone heart. (2) The round charm engraved with either “Thank you for raising the man of my dreams” or “Thank you for raising the woman of my dreams.” (3) The initial in any letter of the alphabet. (4) The white pearl bead or a different color bead if you request. Second Row Right: If you are thinking about customized tote bags, this one certainly has a variety of custom options! Shannen will create yours with a monogram, initials, name, name over initials, or stack a name on top of initial. And get it with or without a bow. If you would like a colored bag instead of natural canvas, look around her shop for other colors. Third Row Left: These Personalized .50 Caliber Bullet Bottle Openers are great gifts for gun or military enthusiasts. They are made from military-grade, once-fired bullets. The Caldone family personalizes them for your wedding or other gift occasion. Third Row Right: Keeping with the military theme, these Customized Ammo Cans are made from military issue .50 caliber ammo boxes. At 12″ x 7.5″ x 6.25″ in size, they are good for miscellaneous storage, as conversation pieces on display, or as a catch-all box in the car or truck. Sara and her team offer seven laser engraved designs: American Flag, Eagle, Oval and Stars, Tire Tread, Buck (great for deer hunters), Police, or Iron Cross. Fourth Row Left: This engraved personalized beer carrier is ideal for anyone in the wedding party who loves to party. You get a choice of dark walnut or American walnut finish. Doug and Andrea can engrave almost any letter size and complicated logo design you’d like. Also, if you are ordering for multiple attendants or parents, be sure to ask about a quantity discount. Fourth Row Right: Watches are typical groomsmen gifts, but this wooden wrist watch with rawhide leather band adds a unique twist to tradition. I was expecting it to be expensive, but Tim is selling them for $34.95 each as of this writing. He will also engrave a message from you on the back. Bottom Left: Photos are another way to personalize an item. Elizabeth’s Pearl Photo Bracelet, for example, includes your own photo(s) and/or message(s) in one or more frames set amongst Swarovski pearls and crystals. You can get up to four frames and choose from 10 pearl colors. Bottom Right: This custom name bracelet is an affordable way to get the flower girl a piece of jewelry that is hers alone. If you have someone else in mind besides the flower girl, there are many different charm variations. Also, choose from 29 different pearl colors. Navkiran will put the bracelet in a pouch or gift box and add a thank you card if you’d like. She also makes a matching necklace.